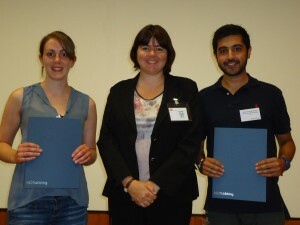 At the Analytical Research Forum last month, held at GlaxoSmithKline and the University of Hertfordshire, UK, there were two poster prizes awarded by Analyst and Analytical Methods. 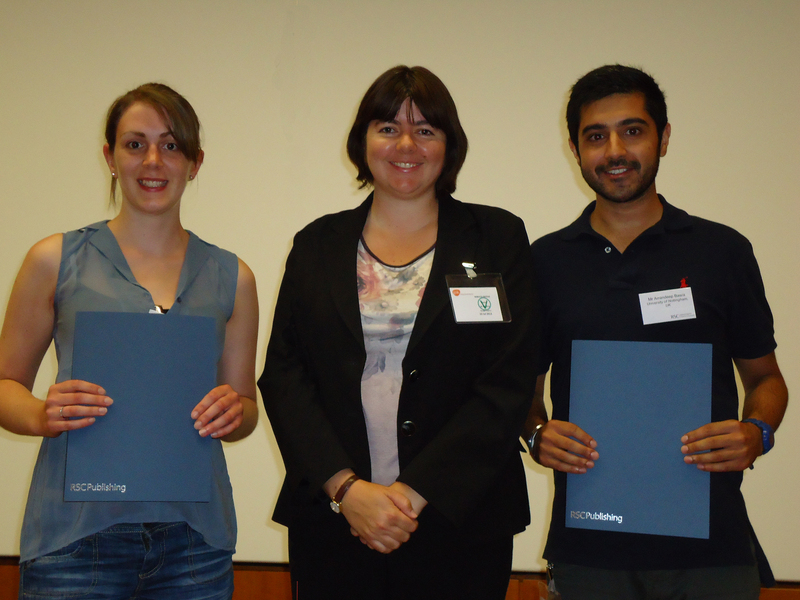 We are pleased to announce that the winners were Helen Robinson, from the University of York, and Arrandeep Basra, from the University of Nottingham. In Helen’s poster entitled “Capturing peptides on gold using self-assembled monolayers (SAMs) for MALDI-MS analysis“, she describes a developed technique to capture and label protein digests directly on a gold-coated MALDI chip, followed by direct analysis from the chip. Arrandeep’s poster was entitled “Size-tunable biodegradable polymeric nanoparticles for controlled drug delivery“. In his poster he describes a study on the formation of nanoparticles and the results from adjusting the formulation parameters to get a range of different sizes and drug loading capabilities. The winners were selected by a panel of judges and the prizes were awarded by Analyst and Analytical Methods Deputy Editor Rebecca Brodie. The prizes included a certificate, free electronic journal subscription, and a book from the RSC catalogue. Congratulations to Helen and Arrandeep!